Can you Silkwrap any transformed creature? I can see why you love my deck haha, our decks share a lot of cards. The playset of Aerial Responder goes very nicely with Lone Rider Flip, and makes Stitcher's Graft plain brutal, and also reliable with three Always Watching . Fun fact: I initially wanted to start my mono-white aggro deck with a playset of Aerial Responder, Stitcher's Graft, and Trusty Companion, but somehow ended up removing all of them. I tried to keep my list human-only to get the most out of Thalia's Lieutenant, and tried to not go below seven equipments, otherwise Strength of Arms is often just a weaker Giant Growth. Although if it means boosting a Lone Rider to flip (ideally while killing a blocker), that's usually still well worth it. Due to Captain's Claws and being mono, Westvale Abbey Flip should be a decent alternate win-con (and token-maker). do you mean that Incited Rabble will deal damage even though it's tapped? 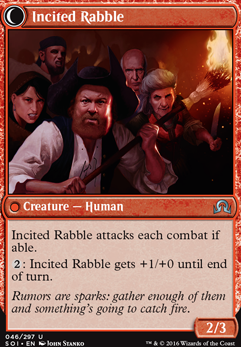 Yes, the Incited Rabble is tapped after flipping and thus can't attack (it only attacks each combat "if able"). Note, however, that if the rabble somehow becomes untaped, it will still have to attack as long as it doesn't somehow have summoning sickness. 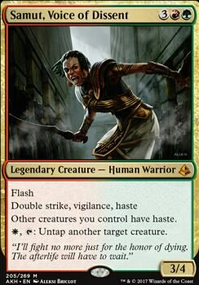 Also note that if your opponent controls a card like Archangel of Tithes or Ghostly Prison, the rabble won't have to attack each combat if you choose not to pay the associated cost. Ok so you have to tap Town Gossipmonger Flip to flip, so say i put him out turn 1, then turn 2 i play Thraben Inspector and tap both to flip the gossipmonger into Incited Rabble. Is the Rabble still tapped after flipping or can i attack with it turn 2? Are you asking if you can use Always Watching and just Town Gossipmonger Flip to tranform Town Gossipmonger Flip into Incited Rabble? or are you implying that you have a second creature that would also be untapped? If you have a second creature besides Town Gossipmonger Flip then yes you could do this. Considering I have Always Watching on the battlefield and I declare an attack using Town Gossipmonger Flip and it's not blocked. Can I use its transform ability and turn it into Incited Rabble to pump it with the +1/+0 ability? So I was looking at SOI cards and realized that none of the transformed creatures, whether Incited Rabble Flip, Timber Shredder Flip, Skin Shredder Flip or Ormendahl, Profane Prince Flip, have a converted mana cost (CMC) in their transformed state. Does this mean that their CMC is 0 And therefore can be targeted by Silkwrap?